The US markets are reaching new highs daily and many investors are happy with the returns their portfolios have generated. According to the Wall Street Journal the S&P 500 is up 13.9% year-to-date. But some foreign markets are doing even better. For example, the Hang Seng (Hong Kong) index is up 29.4%. As part of our asset allocation strategy we always include a foreign component in our diversified portfolios. Over long periods of time international diversification has had a positive effect on portfolio performance. That’s because the US economy is mature. It’s harder to generate the kind of economic growth that smaller, newer, and less developed economies can generate. There is, however, a level of risk as well as reward to global diversification. It’s said that when the US catches a cold, foreign markets get pneumonia. The U.K. market is up only 5.8% this year, Shanghai +9.1%, Mexico +9.5%, Japan +9.6% and France +10.3%. It’s difficult for the average investor to do the research to pick and choose their own foreign stocks. So it’s even more important when investing overseas to use experienced portfolio managers with years of experience and an established track record. We have done the research and we choose the best mutual funds with experienced managers to give our clients exposure to foreign markets. The MSCI Emerging Markets Index, up 28.09%, is the best performing major index year-to-date – better than the DASDAQ, better than the S&P 500, better than the DJIA. That’s an amazing reversal. Emerging Markets have lagged the other major indexes over the last decade. Why do we mention this? A well diversified portfolio often includes an allocation to Emerging Markets. Emerging Markets represent the economies of countries that have grown more rapidly than mature economies like the US and Europe. Countries in the index include Brazil, Chile, China, Colombia, Czech Republic, Egypt, Greece, Hungary, India, Indonesia, Korea, Malaysia, Mexico, Peru, Philippines, Poland, Qatar, Russia, South Africa, Taiwan, Thailand, and the United Arab Emirates. Some of these countries have economic problems but economic growth in countries like India, China, and Mexico are higher than in the U.S. Between 2003 and 2007 Emerging Markets grew 375% while the S&P 500 only advanced 85%. As a result of the economic crisis of 2008, Emerging Markets suffered major losses. It is possible that these economies may now have moved past that economic shock and may be poised to resume the kind of growth that they have exhibited in the past. Portfolios that include an allocation to Emerging Markets can benefit from this recovery. Global interest rates are going up. Global inflation is going up. Global growth is going up. Recession risk is going down. A new consensus is also building. The rise of nationalistic self-interest is upsetting the old order the world over. For the past decade central bankers have been in control of economic policy throughout the world. It has resulted in low or even negative interest rates in an effort to stimulate economic growth. The result has been like pushing on a string. Growth has been slow (the string as a whole hasn’t been moving) and the middle class in the developed world has seen their wages stagnate and their jobs disappear (the middle of the string) while those at the top (the far end of the string) have been virtually unaffected. It’s part of the reason for the change in political leadership in the U.S. and the re-emergence of economic nationalism as evidenced by the Brexit vote in Britain. Tax reform: Trump’s campaign promised corporate tax reform. To make American companies more competitive globally, he has proposed reducing corporate tax rates from 35% to 15%. A special 10% rate is designed to repatriate corporate profits held offshore. Individuals will be taxed at three rates depending on income: 12%, 25% and 33%. Fiscal policy: The Trump administration wants to spend new money on infrastructure: transportation, clean water, the electric grid, telecommunications, security, and energy. Health care: Trump wants to repeal and replace Obamacare. Trade: The new administration has vowed to withdraw from TPP (Trans Pacific Partnership) and renegotiate NAFTA (North American Free Trade Agreement). They also intend to challenge China regarding currency manipulation and unfair trade practices. Immigration: President-elect Trump intends to establish new, tougher immigration controls to boost wages, build a wall along the U.S./Mexico border, deport criminal aliens and end sanctuary cities. Economy: 25 million new jobs over the next decade is the goal of the incoming administration. They aim to boost economic growth from 1.5% to 3.5% or 4.0% annually. The Trump administration will focus on job creation, economic growth, infrastructure spending, reduced regulation, and energy independence while reducing governmental efforts to prevent climate change. The people that Donald Trump has chosen for his cabinet are largely from the private sector; people that have backgrounds in running successful businesses and creating jobs. These things are the primary reason that the stock market has reacted well to the election of Donald Trump. Corporate earnings have been essentially flat for the past three years. Professional investors see opportunities for renewed economic growth, which will increase corporate profits. While we view this development with optimism, we always remain cautious. We expect increased market volatility, especially if terrorist attacks continue throughout the globe. We also expect interest rates to rise as the Federal Reserve brings rates to a more historically normal level. We also see opportunities for the creation of new companies. The number of publicly traded companies has dropped by nearly 50% since 2000. At the same time, the number of companies that are held by private equity firms has grown explosively – by a factor of six! This provides a great opportunity for privately held companies to go public and provide yet another opportunity for greater market growth. As always, we remain cautious in keeping with our philosophy of preserving our clients’ capital. Over the long term, we see the potential for a new American renaissance. Today’s markets are roiled by the decision of voters in Great Britain to exit the European Union (EU), which has been dubbed “BREXIT.” As with most events in the investment world, there are people out there who make a living scaring you. Rather than panic, we recommend you step back and think rationally what this means. First, why did the British people vote to leave the EU despite the unified opposition of both of Great Britain’s major political parties? The answer is that more than half of their voting public was tired of being told what to do by un-elected bureaucrats in Brussels (the capitol of the EU). The people wanted to have a say in how they were going to be governed. In effect, BREXIT was a revolt of the masses against the classes. Polls prior to the election indicated that the vote would be against BREXIT, opting to stay in the EU. The result surprised much of the big money which led to today’s panicked selling at the open. The issue driving Brexit is that people are fed up with an unelected European bureaucracy making important political decisions for them. People are seeing many of the decisions that were once made through Parliamentary democracy delegated to strangers in foreign capitals. People are also becoming wary about a massive influx of refugees what under EU rules can move freely throughout Europe. People who do not share the cultural or political beliefs of the British and who have no wish to assimilate. We will undoubtedly be hearing more about this as the vote nears. It’s fun every once in a while to think about what it would be like if money was no object. For today’s thought experiment we went to Ireland and found a storied castle for sale. 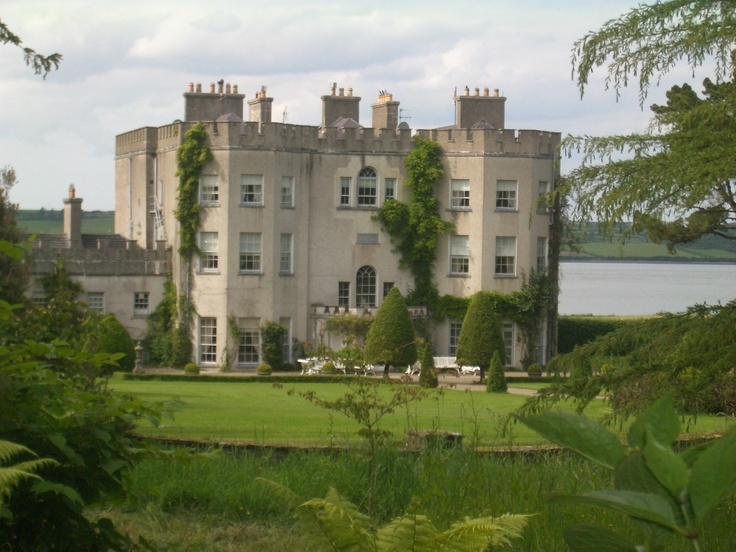 It’s Glin Castle, 700 years old, which was the ancestral home to the FitzGerald clan. Think of it as Downton Abbey set in Ireland. Located in west County Limerick, it sits on 380 acres, 23 of which are “pleasure grounds”—the woodland walks and gardens, both landscaped and informal, that surround the building. It’s been upgraded and operated for a time as a luxury bed-and-breakfast. The furnishings are extra. See HERE for more views. We thought that our readers would be interested in reading the thoughts of some of the leading money management companies. We get information from these companies on a regular basis, and wanted to start passing some of it along. Today we look at the view from the money management shop Neuberger Berman. The complexities of today’s markets and economies are not lost on those who spend each day sorting through them. Diverging monetary policy, plummeting energy prices and shifting economies are all examples of fundamentals on which our investment professionals are focused. These issues have been debated for the better part of 2015 and have led to a very turbulent period for the markets, both equity and fixed income. [The] past year  will shape up as one of the more challenging in recent memory. As we enter 2016, the issues of stagnant global growth, monetary policy and China’s bumpy economic transition that have roiled markets will continue to be a major focus, the outcomes of which will likely drive market returns. We believe the Federal Reserve will take a slow approach to rate increases, that the ECB [European Central Bank] will remain accommodative as necessary, and that China has the financial wherewithal to avoid a severe “hard landing.” As for low commodity prices, they are largely supportive for now, but eventual increases are likely to come for the right reasons, reflecting broader economic health and proper supply/demand balance.